Brian Bissinger is a 3rd grade Learning Expert Teacher originally from Long Island, New York. He received his Bachelor's degree in Childhood Education, grades 1-6, from Long Island University. 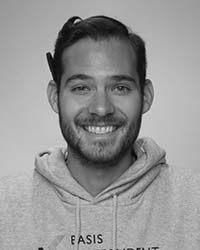 Prior to BASIS Independent Brooklyn, he taught 2nd grade in Cobble Hill for the 2013-14 and 2014-15 academic school years. From 2012-13, he taught 5th grade math in Harlem and prior to that post, from 2010-12, he taught 6th to 8th grade Special Education in Elwood, New York. "My ultimate teaching goal for this academic school year is to help develop a love of learning and prepare every BASIS Independent Brooklyn student with skills that will benefit them after they leave our school. Elementary school is where we set the stage for future success and lay the foundation for true understanding of more complex concepts later on in our students’ academic career," says Mr. Bissinger. "I had teachers that really inspired me, and I want to to do the same for my students. My senior year English Literature teacher, Ms. Richman, had the reputation of being a terrifyingly strict, mean, and unforgiving teacher. I was petrified when I saw her name on my senior class schedule. I walked into her class and sat in the back of the room terrified for my first day. However, on that first day, Mrs. Richman captured my interest immediately. She jokingly played off of her “reputation” and made us all laugh. Not only was Ms. Richman engaging, but she also began each class with an article about social injustice and racism in today’s world. Social injustice, silent complacency, and how to overcome them became the themes of her classroom. From that day on, I sat in the front row and ached when I saw how quickly time flew by! Connecting with great teacher makes all the difference." "Outside of teaching our future leaders", he says, "I can almost always be found on the hills of Prospect Park. Whether I am reading a good book, fishing at the lake or just playing a little soccer with my pup, Prospect Park is where you will find me!"